Get a copy of your 3skeng tool(s) in just a few steps! Learn how to download, install, troubleshoot, activate purchase 3skeng by following the guide 3skeng - Starting Guide.pdf. Work with the tool(s) for a free trial period of 30 days. You want to use the tool(s) after the free trial period? Click here to learn more about the license model, prices and how you can buy 3skeng tool(s) and libraries. Have fun working with 3skeng tools! available as universal installer (ruby-file *.rbz). 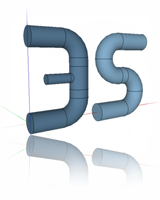 The "3skeng AR 2019 Tool" for SketchUp is free. The use together with the Microsoft HoloLens requires an active license of the 3skeng HoloLens AR App for Windows. It is available for purchase as introduction offer with 32% off in the Microsoft App Store for 995 650 US-$ (~ 879 575 €). "3skeng List 2019 Tool" only 89 US-$ (~ 79 €), upgrades 39 US-$ (~ 34 €). "3skeng Pipe 2019 Tool" only 399 US-$ (~ 349 €), upgrades 179 US-$ (~ 159 €). Detail libraries can be used for one year and start at 59 US-$ (~ 52 €). "3skeng Mount 2019 Tool" only 299 US-$ (~ 259 €), upgrades 139 US-$ (~ 119 €). "3skeng Steelwork 2019 Tool" only 299 US-$ (~ 259 €), upgrades 139 US-$ (~ 119 €). "3skeng Channel 2019 Tool" only 169 US-$ (~ 149 €), upgrades 79 US-$ (~ 69 €). Download previous version "3skeng 2018"
3skeng 2017 Tool purchases include the upgrade to the latest 3skeng Tool version at time of purchase. "3skeng List 2018 Tool" only 89 US-$. "3skeng Pipe 2018 Tool" only 399 US-$, upgrades 179 US-$. Detail libraries can be used for one year and start at 59 US-$. "3skeng Channel 2018 Tool" only 169 US-$, upgrades 79 US-$. "3skeng Mount 2018 Tool" only 299 US-$, upgrades 139 US-$. "3skeng Steelwork 2018 Tool" only 299 US-$, upgrades 139 US-$. Download previous version "3skeng 2017 (ver.2)"
"3skeng List 2017 (ver.2) Tool" only 89 US-$. "3skeng Pipe 2017 (ver.2) Tool" only 399 US-$, upgrades 179 US-$. "3skeng Channel 2017 (ver.2) Tool" only 169 US-$, upgrades 79 US-$. "3skeng Mount 2017 (ver.2) Tool" only 299 US-$, upgrades 139 US-$. "3skeng Steelwork 2017 (ver.2) Tool" only 299 US-$, upgrades 139 US-$. Download previous version "3skeng 2017 (ver.1)"
"3skeng 2017 (ver.1)" causes a bugsplat when you quit SketchUp 2017 PRO/Make on MAC! "3skeng Pipe 2017 (ver.1) Tool" only 399 US-$, upgrades 179 US-$. "3skeng Channel 2017 (ver.1) Tool" only 169 US-$, upgrades 79 US-$. "3skeng Mount 2017 (ver.1) Tool" only 299 US-$, upgrades 139 US-$. "3skeng Steelwork 2017 (ver.1) Tool" only 299 US-$, upgrades 139 US-$. Download previous version "3skeng 2016"
3skeng 2016 Tool purchases include the upgrade to the latest 3skeng Tool version at time of purchase. "3skeng Pipe 2016 Tool" only 399 US-$, upgrades 179 US-$. "3skeng Channel 2016 Tool" only 169 US-$, upgrades 79 US-$. "3skeng Mount 2016 Tool" only 299 US-$, upgrades 139 US-$. "3skeng Steelwork 2016 Tool" only 299 US-$, upgrades 139 US-$." Download previous version "3skeng 2014"
3skeng 2014 Tool purchases include the upgrade to the latest 3skeng Tool version at time of purchase. "3skeng Pipe 2014 Tool" only 399 US-$, upgrades 179 US-$. "3skeng Channel 2014 Tool" only 169 US-$, upgrades 79 US-$. "3skeng Steelwork 2014 Tool" only 299 US-$, upgrades 139 US-$. Please note that all 3skeng tools are only available in English for Microsoft Windows systems (XP, Vista, Windows 7, Windows 8 & Windows 10) and MAC OS computers. The annual fee for each detail library for "3skeng Pipe" and "3skeng Mount" includes all content updates, in other words, you always have the latest library version available! 3skeng tool purchases after November, 1st 2018 get a free tool upgrade to "3skeng 2019". The new tool versions are ready for use right after the installation of 3skeng 2019. Special rates apply for resellers, educational use and if you need licenses for multiple workstations. Just send an e-mail to sales@3skeng.com to get more information.